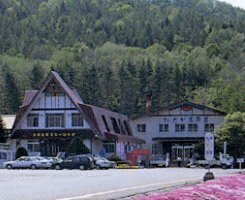 The Sarugawa hot spring is situated in the place which intersects the national highway No. 247 (Ishikari- Jukai load) which connects the Hokkaidou eastern part to Sapporo, and the national highway line of No. 237 from Hidaka. This is the recreation institution of the Hidaka town ownership, and has camping space and sport institution. The Hidaka international skiing area which is the Hidaka district only skiing area is opened in winter. Hidaka kogen-so is a hot spring hotel which served also as the skiing lodge. The road was congested as we went to Sapporo from Obihiro via the national highway No. 247. Then, we dropped in here. The site is large and the building is quite old. The hot spring is an ordinary public bathroom except a sauna. It is regrettable that there is no open-air bath. Water is a simple sulfur cold mineral spring, and is heated. Since the bathtab was widely vacant, I have been happy-go-lucky. The shampoo is also prepared. Although it is a little old institution, probably, it is good to use when you get tired with driving. There are about 120kms from Sapporo. It is near the crossing where the national highway No. 274 and the national highway No. 237 cross. Progress in the direction of the Hidaka-cho for a while from a crossing. From the crossing to 2km From Sapporo, it is a car and is 2 hours and about 30 minutes. There are enough car parking spaces.